I rarely read the same book twice, but for Diamond Dave, I made an exception. 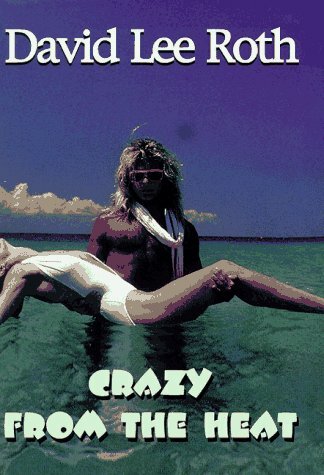 I first read Crazy from the Heat by David Lee Roth over ten years ago. From my humble roots in Ohio, I grew up with the music and videos of Van Halen and David Lee Roth. He was unlike anyone I had ever seen before. His cadence and energy have always fascinated me. While the rest of Van Halen was busy getting fat and becoming alcoholics, DLR was traveling through the Amazon and attempting a climb of Mount Everest. He wasn’t just a rock star, he was a super hero. Whenever someone asks me what celebrity I’d most like to meet, I always say David Lee Roth. I don’t even listen to his music anymore. It doesn’t matter. Diamond Dave is everything I wish I could be. Sadly, I’m only about 1% of the personality of DLR. This is what DLR says about himself in the last chapter. Everything with me has to be dramatic. Everything with me has to be full of emotion and drive and tragedy and catastrophe, valor and victory. Not to the extent of feeling a deathly sense of loss because somebody butted in front of me in the movie line, but in the spirit of living large. Every day I rejoice about something and I’m totally delighted and I’m the most fortunate guy on earth. Since the book was released in 1997, David worked as an EMT and had a brief radio career. His radio show was good, but not morning drive material. Had CBS Radio put his show on evenings, it would have been very successful. Now he is back touring with Van Halen. I’m certain Dave has enough material for a second book by now. Knowing DLR, he might release a Spanish version of the Bluegrass Jump. Back in 1986, he did an Espanol version of Eat Em and Smile called Sonrisa Salvaje. David Lee Roth is awesome! The only major miscue he’s had is his whole “bluegrass” phase (he basically ruined Jump for me because of it http://www.youtube.com/watch?v=Za2oatuzwKQ&playnext_from=PL&feature=PlayList&p=7AAC1E67B06E700B&playnext=1&index=17). I remember being super bummed when he left Van Halen (and later when people were complaining about “Van Haggar”) but really liked both his solo album and videos he released after it. Maybe in his second book he can apologize for the whole bluegrass thing…..I haven’t felt that violated since my wife made me watch “Twilight”. I never bought Dave’s book but I do remember thumbing through it at Barns and Noble when it came out. He certainly is a interesting person and brings out the spirit of venture in anyone who is like-minded. Im sure he’s lived the life of a hundered men. I saw the 1984 tour with him in Van Halen and have vivid memories, I can’t think of a better concert since then. I’ve seen him solo too with Steve Vai and also two or three more times at smaller venues. He puts on a good show. He could maybe grow up a little though, its probably harder for a rocker. I also saw the reunion tour which was nothing like the old days, somewhat dissappointing, but deffintely better then Van Hagar. That’s great. I never got to see DLR or VH. His book was 300+ pages, but the intro stated it was originally 1200+ pages. My guess is DLR has a lot more stories he could release. Just a travel book by him would be worth reading.